The Galleries is at the centre of the local community and we are committed to delivering a positive experience for all visitors. That’s why we are getting involved in Purple Tuesday, the UK’s accessible shopping day. Autism and Dementia training for our staff. Lifts and ramp access to all floors. 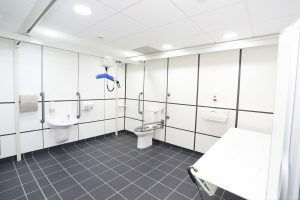 A Changing Places facility alongside disabled toilets. Free wheelchair and motorised scooter hire for registered shoppers.